China's courts and World Bank Group will increase cooperation to improve the global business climate, according to the heads of the Supreme People's Court (SPC) and the World Bank. 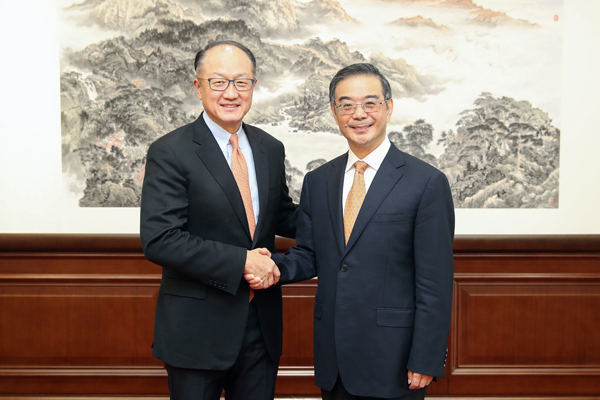 Zhou Qiang, chief justice and president of the SPC, welcomed the World Bank delegation led by President Jim Yong Kim on Nov 2. The two sides showed their willingness to work together for improvement in international business. Zhou outlined achievements the World Bank has made in multilateral trade and business climate advances and added that the World Bank's annual report on doing business provides important information to help China improve its business environment. According to Zhou, China's courts have made efforts to build a more convenient and internationalized business climate through deepening judicial reform and promoting modernization of adjudication mechanisms and trial systems. Special courts for intellectual property and financial cases are being established to deal with such issues more professionally. During their meeting, Kim affirmed China's performances in adopting intellectual devices and technologies to judicial procedures and said such experiences should be promoted to the world.